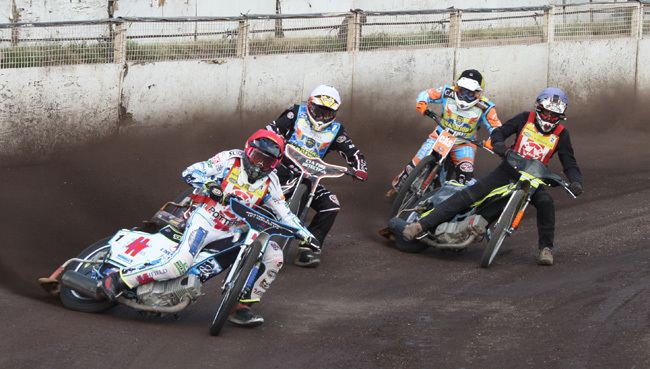 STOKE gained their first Travel Plus National League victory of the season gaining a 32-27 victory over the Isle of Wight at Loomer road on Saturday night, after the meeting was abandoned after ten heats due to track conditions with the result standing. The Potters took the lead in the opening heat as Max Clegg defeated Danno Verge for a Potters 3-2 after Clegg had come off 15 metres when he touched the tapes and after firstly Paul Burnett had fallen and been excluded and then visiting number one Ben Morley also fell and was excluded. Isle of Wight struck back with a 5-1 from former Potter Shaun Tedham and Dale Lamb over Josh Embleton to leave the Potters trailing, but the A.R. Richards Potters struck back immediately with a 5-1 from skipper Tony Atkin and Adam Extance over Scott Campos to put the Potters back in front. The Warriors though gained a 4-2 in the following race as Alfie Bowtell took the chequered flag ahead of Rob Shuttleworth with Tedham taking third with the Potters trailing after four heats 11-12. After a series of drawn heats, the Potters gained the upper hand in heat seven with a 4-2 from Shuttleworth and Joe Alcock over former Stoke rider Chris Widman and followed that up with a maximum 5-1 in the next heat from Alcock and Embleton to open a 26-21 lead after eight races. The next two races were drawn heats as Bowtell took victory in heat nine and Clegg in the following race before heat eleven was stopped after all four riders had moved at the start then almost simultaneously as the red light came on Morley, Lamb and Alcock all fell. The Warriors then called the referee down to the track for an inspection and after discussions on the track the referee abandoned the meeting due to track conditions with the result standing. Both teams lost riders during the meeting with Paul Burnett being pulled out after his first ride fall and then Danno Verge and Scott Campos being withdrawn for the Warriors. STOKE 32: Max Clegg 8, Tony Atkin 7, Rob Shuttleworth 5, Adam Extrance 4+3, Josh Embleton 4+2, Joe Alcock 4, Paul Burnett 0. ISLE OF WIGHT 27: Alfie Bowtell 9, Shaun Tedham 6, Chris Widman 3+1, Dale Lamb 3+1, Ben Morley 3, Danno Verge 2, Scott Campos 1.